The era of smart phones is redefining public transport, providing ease-of-use, security and convenience to travel seamlessly across multiple modes of transport. Host Card Emulation (HCE) offers the capabilities of a smart card on a mobile device without relying on access to a secure element. 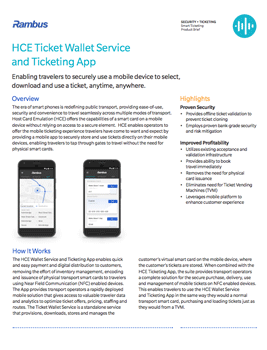 HCE enables operators to offer the mobile ticketing experience travelers have come to want and expect by providing a mobile app to securely store and use tickets directly on their mobile devices, enabling travelers to tap through gates to travel without the need for physical smart cards.